Make this Healthy Weeknight Instant Pot Chicken Breast Recipe (Pressure Cooker Chicken Breast) plus rich Homemade Chicken Gravy. Comforting, hearty flavors made with simple real, whole food from your pantry. Super easy & quick weeknight meals! Some days where we’re so worn out after a long day of work, kids, chores…we dream of going home (everything clean and tidy), crashing on the couch, and binge-watching netflix to sleep (with a belly full and family happily fed). The best part? Super easy to make with simple real ingredients! Heat up your pressure cooker (Instant Pot: press Sauté button and click Adjust button to Sauté More function). Make sure your pot is as hot as it can be (Instant Pot: wait until indicator says HOT). Pat dry the chicken breasts’ skin with paper towels. Season with generous amount of kosher salt and ground black pepper. 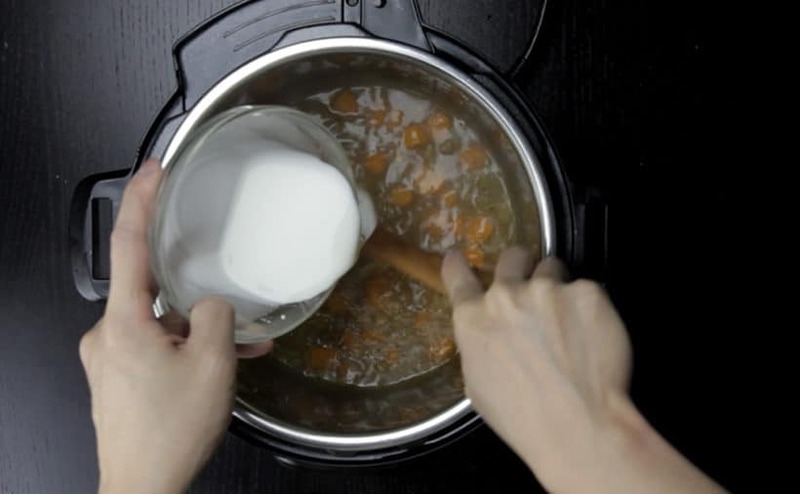 Pour 1 – 2 tbsp (15ml – 30ml) olive oil in pressure cooker. Ensure to coat oil over whole bottom of the pot. Place 2 chicken breasts (skin side down) in the Instant Pot. Do not overcrowd the pot. Season the meat side with more kosher salt and ground black pepper. Brown the skin side (don’t touch it for 3 ½ minutes). *Pro Tip: The chicken skin will stick to the inner pot in the beginning, but it will release itself at the 3-minutes mark. Flip and brown the meat side for 1 ½ minutes. Remove and set aside. *Note: If you are preparing 4 chicken breasts, repeat this step for the other 2 chicken breasts. Add diced onion in the pressure cooker. Sauté for roughly 2 ½ minutes until soften and lightly browned. Add minced garlic and sauté for another 30 seconds until fragrant. Season with kosher salt and ground black pepper. Add in chopped celery and carrot. Sauté until the vegetables are slightly browned (roughly 3 minutes). Optional layer seasoning: taste and season with more kosher salt and ground black pepper. Add a dash of sherry wine in the Instant Pot and deglaze by scrubbing the flavorful brown bits off the bottom of the pot with a wooden spoon. Add 1 cup (250ml) unsalted chicken stock, 1 bay leaf, a pinch of salt, rosemary, and thyme (rub the herbs with your fingers to “activate” them). Give it a quick stir and layer 2 – 4 browned chicken breasts on top. 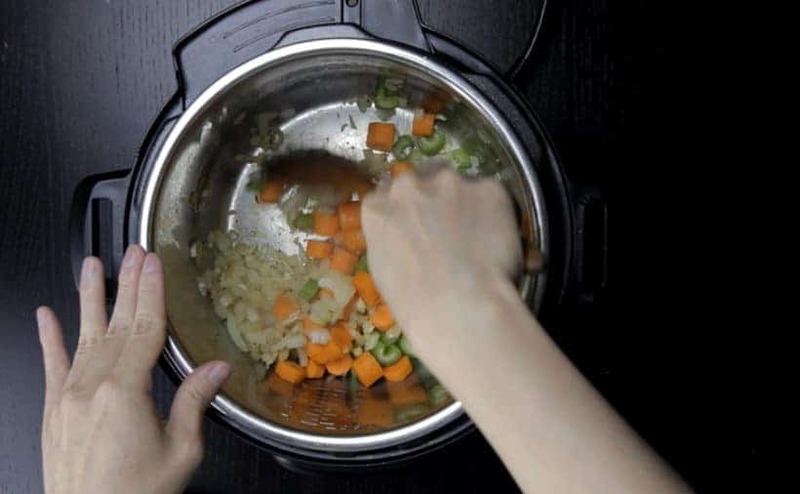 Pressure Cooking Method: High Pressure for 5 minutes, then 10 minutes Quick Release (after pressure cooker has finished cooking, wait 10 minutes then carefully release the remaining pressure). Set aside the cooked chicken breasts on a chopping board. In a small mixing bowl, mix 2.5 tbsp (22.5g) cornstarch with 3 tbsp (45ml) cold water. Taste the gravy and season with more salt & black pepper if necessary. Slice Instant Pot Chicken Breasts & serve with homemade Instant Pot Chicken Gravy with your favorite Instant Pot Side Dishes. Prepare Pressure Cooker: Heat up your pressure cooker (Instant Pot: press Sauté button and click Adjust button to Sauté More function). Make sure your pot is as hot as it can be (Instant Pot: wait until indicator says HOT). Prepare Chicken Breasts: Pat dry the chicken breasts’ skin with paper towels. Season with generous amount of kosher salt and ground black pepper. Brown Chicken Breasts: Pour 1 - 2 tbsp (15ml - 30ml) olive oil in pressure cooker. Ensure to coat oil over whole bottom of the pot. Place 2 chicken breasts (skin side down) in the Instant Pot. Do not overcrowd. Season the meat side with more kosher salt and ground black pepper. Brown the skin side (don’t touch it for 3 ½ minutes). Flip and brown the meat side for 1 ½ minutes. Remove and set aside. *Pro Tip: The chicken skin will stick to the inner pot in the beginning, but it will release itself at the 3-minutes mark. Sauté Onion and Garlic: Add diced onion in the pressure cooker. Sauté for roughly 2 ½ minutes until soften and lightly browned. Add minced garlic and sauté for another 30 seconds until fragrant. Season with kosher salt and ground black pepper. Sauté Celery and Carrot: Add in chopped celery and carrot. Sauté until the vegetables are slightly browned (roughly 3 minutes). Deglaze: Add a dash of sherry wine in the Instant Pot and deglaze by scrubbing the flavorful brown bits off the bottom of the pot with a wooden spoon. Pressure Cook Chicken Breasts: Add 1 cup (250ml) unsalted chicken stock, 1 bay leaf, a pinch of salt, rosemary, and thyme (rub the herbs with your fingers to “activate” them). Give it a quick stir and layer 2 - 4 browned chicken breasts on top. 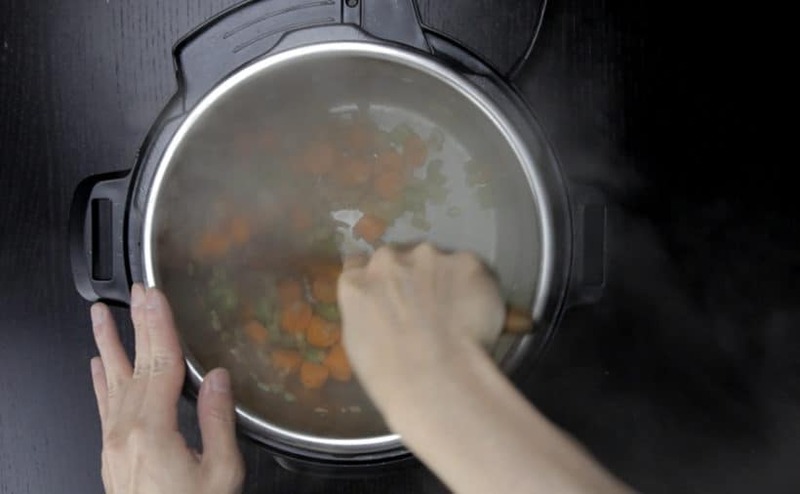 Close lid and pressure cook at High Pressure for 5 minutes + 10 minutes Quick Release (after pressure cooker has finished cooking, wait 10 minutes then carefully release the remaining pressure). Turn off the heat. Open the lid carefully. Thicken Gravy: Set aside the cooked chicken breasts on a chopping board. Press Cancel button, then Sauté button to heat up the sauce. In a small mixing bowl, mix 2.5 tbsp (22.5g) cornstarch with 3 tbsp (45ml) cold water. Mix it in one third at a time until desired thickness. Taste the gravy and season with more salt & black pepper if necessary. Serve: Slice chicken breasts & serve with gravy with your favorite side dishes. this chicken and the gravy you make is delicious. Hi, thanks for your detailed recipes! You guys have been a reliable source for IP! Question: I have a whole chicken cut in pieces (thigh, drum, breast) that I plan to IP in a stew. Any suggestions for cooking them altogether without drying out the breast? Do you think I should cook the dark meat for 10 min and then add the breast for another 5 min? Thanks! Can this be made without the carrots? If so, does that effect the cooking time? Thank you for your question. The cooking time will be the same. I am looking forward to making this, as every recipe of yours that I’ve tried has come out amazing. My question is are any changes to the cooking time or sauté time needed if I am using boneless, skinless chicken breasts, as this is what I have in the house? Thank you for your question. You can reduce the cooking time by a minute. Made this for myself and my 3 kids (1yo, 3yo, and 5yo) while my wife was at work tonight. We all loved it! I almost didn’t leave any leftovers because it tasted so good! Happy to hear your 3 kids enjoyed it as well! Great recipe. I modified it to be low-FODMAP as follows: Smash the garlic (don’t mince) and cook it in the oil first. Remove the garlic when lightly browned and discard. Cook the chicken per the recipe. Omit the onion, cook the celery and carrots, and halfway through cooking those add the green parts only of a bunch or two of scallions (just cut them with scissors directly into the pot). 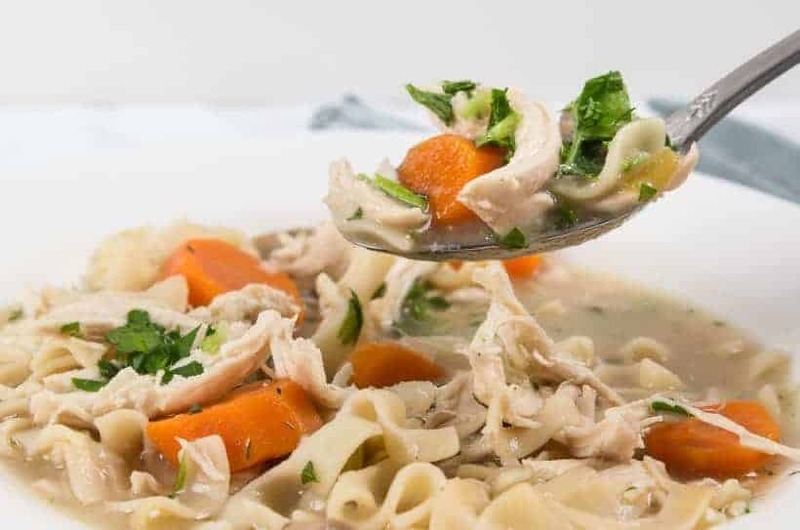 Use a low-FODMAP chicken broth, and otherwise follow the recipe. Turned out fantastically. Thank you! Thank you for sharing the low-FOPDMAP method as well! How do the carrots and celery come out? I have not had any luck with cooking vegetable the chicken. It comes out mushy. Any tips? For this recipe, the carrots and celery will be soft as they are mostly there to add flavor to the gravy. I bought the Instant Pot 2 weeks ago and have made this recipe twice already! I got a “delicious!” and “thumbs up!” from my husband which is something very hard to do!! I am a very slow cook but was able to get it on the table within 1 hour after getting home at 7PM from work. I feel great about giving my family the food I made from scratch and so yummy! Thank you for the recipe and for inspiring me to continue to keep trying!! Thank you for sharing your story and kind words! I love all your recipes and would like to try this one but instead of chicken breast, can I use 4-6 bone in chicken thighs? If so, how long should I pressure cook the chicken and natural release? Thank you so much in advance! Chicken thighs will work just fine. They will take 6 minutes and 10 minutes natural release. Can I add rice to it ? Adding rice to the recipe is not ideal as the chicken breast will be overcooked. This was delicious! I did 2 bone in chicken breasts and used red wine instead of sherry. Next time I think I’d add some cubed potatoes and it’ll be a full meal. Thanks for sharing it! Yes, you can use the leftover stock for other recipes. Make sure to reduce the amount of salt as the leftover stock is already salty. Hi Amy and Jacky! Our family loves all ur recipes!! We r making this chicken breast today, is it 5+10 natural release or quick release? Just to be sure! Thanks!! If the pressure is not fully released after 10 minutes, you can release the remaining pressure by turning the venting knob to venting position. Sorry for the late reply as we are still in the middle of moving. The skin (& bone) will actually protect the chicken breast from drying out so it is best to remove the skin after pressure cooking. I just finished making this for my husband. He is THE FUSSIEST eater. He said that this was the “Best Chicken ever”. I mentioned before that he was not impressed that I had purchased him the Instant Pot for Christmas. I actually filled out a return request to Amazon. Then I discovered your site and decided to brave this myself. I have never been the cook in the family. So thank you for your awesome recipes. The gray was so delicious and tasted rich without heavy ingredients. The chicken…came out next to dry. The gravy made eating it possible. How can I make this and get juicy chicken? The chicken breast shouldn’t be dry with 5 minutes + 10 minutes Natural release as long as they are skin-on. Were the chicken breast served immediately or were they in keep warm mode or on the table for a longer time? I would recommend brining as it will keep the chicken more moist. This is only my second attempt at the instant pot and am still getting used to what release is used when. After reading through the comments I realize now that I made a happy mistake. I did a quick release after the 5 minutes of pressure cooking….even though it did not take 10 minutes for all of the pressure to release, I waited the full 10 minutes before opening it. I ended up with super juicy boneless/skinless chicken breast! Delish!! I am also new to the IP Looking forward to making this recipe tonight. Will it make any difference if I take the skin off the chicken. I know it will cut the calories. but does it need the extra oil from the skin. I have tried many of your recipes and they are all delicious. It is amazing ho much more flavour you get from the IP. The skin will protect the meat from getting dried. I would recommend taking off the skin after pressure cooking. I was hoping to make this chicken tonight as my first recipe, opened my instant pot did my water test. It came to pressure, then 1 minute into the steam cycle it let out a very loud hiss and a big puff of steam from under the lid. It was really loud (my kids heard it outside!) I turned it off, waited for pressure to release naturally, rewashed the sealing ring to check for debris, put it back on, tried again and the same thing happened! I assume there is no way that is normal. Any thoughts on what’s wrong? It is not normal with the loud noise. Contact the Instant Pot company and see what they say! I am very new to the Instant pot. I have the Duo. 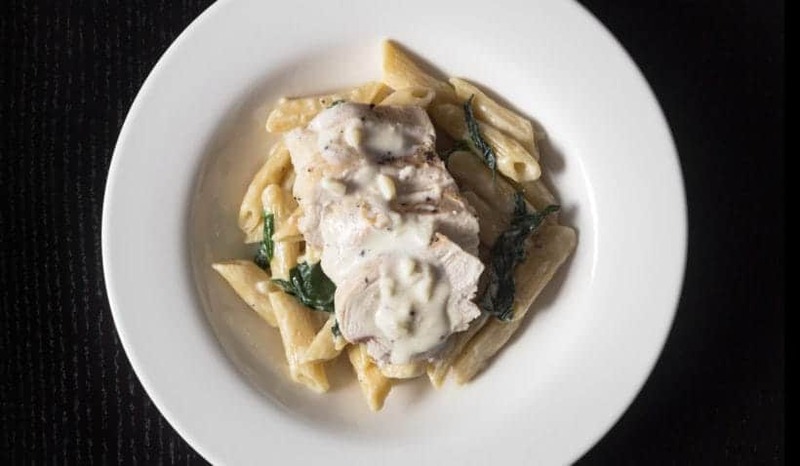 I would like to try this recipe tonight, but can I use frozen chicken breast, and would I need to increase the time? Or do they need to be thawed? For this recipe it is best to thaw the chicken breast. To cook frozen chicken breast, you will want them to be at least 90% submerged into the cooking liquid. So after the 5 mins of high pressure, do I do quick release and let it sit for 10 mins since now it is in keep warm mode or do I keep it cooking on high pressure but have the quick release valve open? Love how your have pictures along with the recipes for a “newbie” like myself!! Smells delicious so far! Thank you! It means after 5 minutes of High pressure cooking, let it sit for 10 minutes before turning the venting knob to venting position to release the remaining pressure. Thank you and by the way it was delicious! Love your website keep up the great work and recipes please! thank you Jody 🙂 !! Hello! This sounds amazing and just what I want for a weekday meal. I’m wondering if I can pop a few potatoes into the pot and cook them at the same time? Would that impact cooking time at all? Really enjoying all your recipes! You can cut up potatoes into 8 pieces per potato. The chicken breast will overcook a bit as the get up to pressure time will be longer. The pressure cooking time will stay the same. I would recommend using chicken thighs and increase the pressure cooking time by 1 minute. I made this tonight and added 8oz of sliced fresh mushrooms. It’s a keeper! Thanks for your quick response and I really appreciate the advice that doubling the sauce would overcook the chicken due to extra get up the pressure time. Do you have any advice on how to alter the cook time so I could double the sauce and not overcook the chicken? Maybe reduce the cook time or pressure release time by a minute or two? Also, this is our new favorite dish! I made it again last night and it was just as awesome as the first night. We serve it with potatoes and steamed veggies and pour the sauce on everything! I would recommend reducing the cooking time by 1 minute and the natural release time by 2 minutes. Hi, I made this tonight with 2 breasts and it was awesome! We want to do it again with 4 breasts so we can have leftovers and i plan to double the sauce and everything, but my question is: the 2 breasts took up most of the pot, similar to your picture above… for four breasts should I just stack them on the original 2 or use a trivet or something? there would not be enough room for 4 breasts to have their own space. should I add extra cook time? It was absolutely perfect tonight following your recipe with two breasts, I just want the same great results again! Doubling the sauce will increase the get up to pressure time and will overcook the chicken breasts so I would recommend against that. You can lightly layer the other 2 chicken breasts on top of the two chicken breasts or you can place the 4 chicken breasts on their sides without packing them too tightly. Hello! Excited to try this recipe. One question: would anything change if I used chicken breast on the bone? Cook a minute longer? 1 minute longer will work great with bone-in chicken breast! I am so excited to make this for family dinner. How would you recommend I double the recipe to make 8 breasts and have enough gravy for everyone? I would layer a trivet on top of the first 4 chicken breasts and place the other 4 chicken breasts on top.